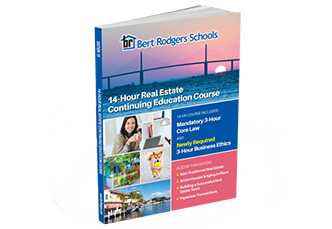 Bert Rodgers makes it easy to renew your Florida Real Estate license by providing convenient online and correspondence 14-hour renewal courses. The links below will enable you to quickly grade a completed CE course, or enroll in the course that you need. Since 1958, Bert Rodgers has focused on providing courses that are designed for individuals who believe in quality, affordable education, formatted to meet their scheduling needs. If your goal is to obtain or renew your professional license, our courses will help you do so, and our staff is here to support you every step of the way. Give us a call today at 800-432-0320 .